A press release is a 400 to 600-word news statement regarding your business that is shared with the media to generate positive news coverage. To write a good press release, include a compelling headline, a powerful lead paragraph, and an informative body. If written well, a press release can dramatically increase your brand awareness. When your press release is ready, the next step is to get it in front of the right people at the right time, which is both expensive and time-consuming. Hire eReleases, a nationwide press release distribution service, to deliver your press release to verified emails for journalists and media outlets. With a 94% delivery success rate, this means that eReleases gets your press release in front of nearly 100,000 journalists — giving you syndication across the country. Click here for 33% off. Your press release topic is the newsworthy story you want to share with the media. This can be anything from a new hire announcement to an event showcase. Knowing the specific topic will not only help you determine the crucial information you need to share, but who your audience is, so be sure to outline your news or message clearly and succinctly. Then, reference the list below to see what content should be included in your release. New Hire – Bringing on a new staff member, especially a key or high-level hire, is an effective way to show the public that your business is growing or changing positively. These press releases should include the new hire’s name, title, a short biography, and what they will add to your organization. For more specific information on how to write a new hire press release, read our article on how to write a new hire press release. New Product or Service – An announcement about a new product or service can generate brand buzz and encourage sales. Include the new service or product name, brief details on what it is, the date it will be available, and how to find out more information about it. Business Event – Issuing a press release for an event not only increases attendance, but shows the public how you are engaging the community. Include the event’s name and purpose along with the event date, time, location, where to purchase tickets, and any required dress code. Industry Award or Recognition – Announcing an award or recognition shows your brand to be high-quality and trustworthy. In these releases, include a description of the award, what the requirements of winning were, and how this positions you in relation to your competitors. Book Press Release – Authors can benefit from issuing a press release about a book to the media and public; not only does this alert fans that the book is available for purchase, but encourages media outlets to schedule interviews, which can increase book sales. These releases should include the book title, a brief synopsis, and where it will be available for purchase. Once you know the details you need to include in your release—and who your target audience is based on the topic—outline your content so you can assemble it easily. If you have questions about what information should be included, take a look at these press release examples. Before you start writing, set up your press release document using a standard word processor with the right margins, fonts, and sizes. Proper, consistent formatting makes it easy for journalists to find the important information on your press release quickly and easily. First, select a document sized 8.5 x 11 inches with a white background. Next, be sure to add your logo and letterhead to the top of the document (if not already in place). Finally, set your margins to be one-inch all the way around the edges of your press release. While this kind of detail may seem unnecessary—or even make it more difficult for your release to stand out—it’s important to know that journalists, newswire and syndication services, and news sites will often not read or publish a press release if they are not in this format. For the same reasons mentioned above, it’s important to use a standard font type, size, and color when writing your press release. Use Times New Roman or Arial fonts for easy readability, and make sure that the text is black. These standards were established in part because the font type and color are the most universally “readable” by both journalists and computer programs that scan press releases for the pertinent information. Below your logo, include contact information for a person at your company who can respond to questions about your press release. This information should be right-justified and placed below your logo. Always include a specific person’s name with their direct email address and phone number; never include generic contact numbers or emails. Also, add in your release schedule opposite your contact information; this should be left-justified. Most releases will be for “Immediate Release” so journalists know they can use the included information right away. Occasionally, you will want to mark your release as embargoed, meaning you would like journalists to hold off publishing your news until a certain date. In this case, you would write “Embargoed Until” and the date the information can be published. 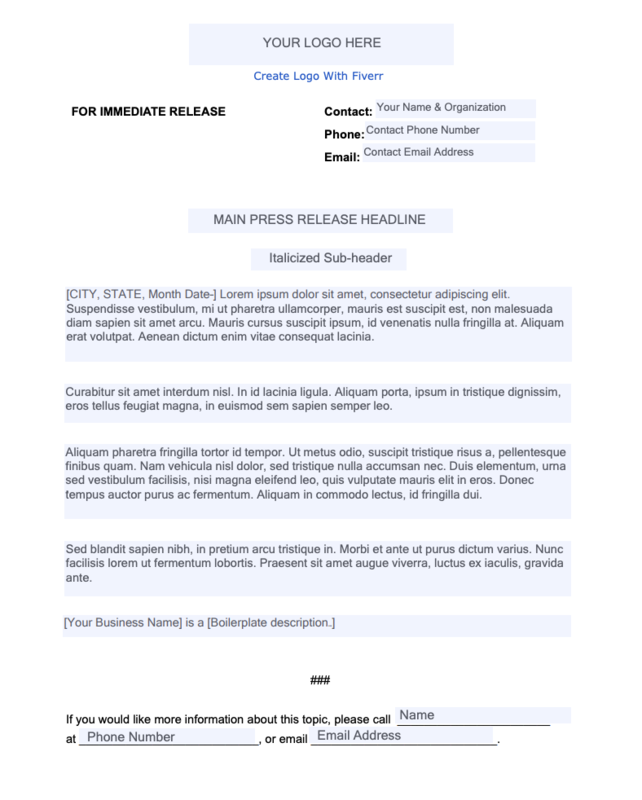 Your press release headline should be between 65 and 80 characters, serving as the title of your release. Position it in the top center of your document, underneath your contact information, and be sure to use 14 point Times New Roman font. The headline should be concise and compelling, clearly communicating your primary message or news. Additionally, you should consider using keywords in your headline that will rank well in Google. While press releases generally don’t have a lot of SEO value, they can appear in Google search results if they include keywords that people frequently use in searches. To find keywords that might suit your topic, you can use an online tool like Ubersuggest. Look for keywords that have a volume of 200 or more (200 or more searches a month) and align with your message or news. Subheaders are centered right underneath the headline and are no more than 20 words. This additional copy is intended to provide more information about your news story while serving as a “hook” that encourages journalists to keep reading. Write your subheading so it is consistent in tone with your headline, but also offers more information. Public relations experts advise looking at the subheader as a way to show clear impact and widespread appeal of the news you’re sharing in your release. In the example below, Microsoft announces a new opportunity in the headline and then expands on that information with cost details and implications of the opportunity in the subheader. The lead paragraph falls under the subheader, consists of 50 words or less, and is led by the location of the business and the date of the press release. The remaining copy answers five questions—the “who, what, where, when, and why”—in two to four sentences. These sentences are crucial, as few people read beyond the lead paragraph of a press release. 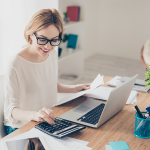 Start your first paragraph by adding the location the press release is coming from—most often the location of your business—and the date it is going to be published. Separate this information from the remainder of the paragraph with a dash. The location should be spelled out in all capitals, and both the location and date should be bolded. Media outlets will look for this crucial information after they read the headline and subheader. The date lets them know when you want to publish the press release news, and the location indicates what location-specific news outlets will likely be interested in covering that news. In the next two to four sentences of your release, address the “who, what, where, when, and why” of your press release topic. This ensures that you provide all pertinent information to the reader quickly and concisely. Don’t worry about details here; you can expand this information further in the body of your press release. Who – Who’s involved? What company? Which individuals? What – What happened? What’s the story? What’s going on? Where – Where did it or where will it happen? When – When did it happen? When will it happen? Why – Why does it matter to the reader? The impact of your press release depends on this opening salvo. Leave the details for later paragraphs and answer each of these large questions as concisely as possible. Maintaining the proper length is important in this section, too, as journalists have very little time to review press release content. The body of your press release should be three to five paragraphs and follow the lead paragraph. Write these paragraphs as concisely as possible—ideally not to exceed 300 words—and include all of the specific details about your topic as noted in step one. To add more interest and credibility, close with a clear call to action and incorporate a quote as support for your news or message. A call to action (CTA) is a sentence that tells your reader exactly what you would like them to do after reading your press release. Your call to action should be clear, actionable, and concise. It should also make it easy for a reader to take action. For example, if you are promoting an event, include a link to get tickets. If you are releasing information about a new hire, provide a social media account or webpage where journalists can get more in-depth information. This ensures that readers follow you beyond the press release, and can often result in coverage of company news not included in your release. A quote from an outside source, added to the body of a press release, boosts credibility by offering unbiased support for your press release topic. Add this quote as a standalone paragraph within the body, ideally after the second paragraph. Quotes should not be more than 80 words and include clear attribution. Try to get a quote from an authoritative figure in your industry. CEOs, owners, and presidents are good choices because they are well-known and highly respected. You can also reach out to managers, senior employees, or other people who are directly involved in the topic that you’re discussing. The final major section of your press release is your company boilerplate. This brief company description informs readers about what your business is and what it does. A good boilerplate is usually 30 to 100 words. Write this information at the end of your release, below the final paragraph. This boilerplate below is a good example because it includes some background on the company, tells exactly what they do, and explains how they are unique in the music industry. It also offers a link to find out more information. To learn more about how to write a boilerplate that will make your business shine, read our article on how to write a press release boilerplate. Below the boilerplate, add three pound signs (###), then add the same contact information you included at the top of the release so journalists can easily reach out to a company representative with questions. You can add additional contact points here, but always include the name of a specific person, his/her direct email address, phone number, and, if available, social media handles. Now that you have written your press release, you are ready to get it into the hands of journalists, reporters, and media outlet representatives. You can distribute your press release in three primary ways: by posting on your website, by using distribution services, and by sharing a link on social media. For the best results, you should use all three methods of distribution. 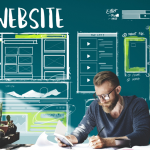 Add your press release to your website both in HTML format—typically as a post—and as a PDF. Maintaining an archive of press releases on your site provides some SEO benefit, as mentioned above, while also ensuring anyone in the media has ready access to past releases. Be sure you create a separate page for these releases, titled “News,” “Updates,” or “Press,” and add this page to your main website menu. Using a distribution or syndication service to put out your press release will ensure that your press release gets sent to the right media outlets and reporters. To distribute your press release quickly, navigate to a press release distribution site and fill out the submission form on their site. Be sure to include all of the content covered in this article. Once submitted and distributed, many distribution services will allow you to track mentions of your press release topic on the internet. If you use a credible syndication site like eReleases, you will be able to reach thousands of news agencies, including TV stations, major news networks like Fox News and MSNBC, and hundreds of news journals and websites. Post a link to your press release on all of your business’ active social media channels. You can use the direct link from the press release archive on your website or the direct link offered by your distribution service. By sharing your release on these channels, followers can easily read and share it, increasing awareness of your release topic. A successful press release effectively and concisely conveys the who, what, where, when, and why of their news—all in a properly formatted document with a headline, subheader, lead and body paragraphs, a quote, a boilerplate, and contact information. To show you examples of the best press releases in 2019, we reached out to public relations experts. 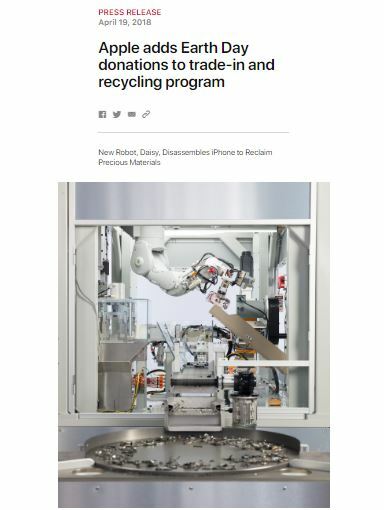 In this press release, Apple lets the public know that they made a donation to the non-profit Conservation International. They tied this donation to how it could benefit the public, which made it both appealing to the reader and increased loyalty to the brand. 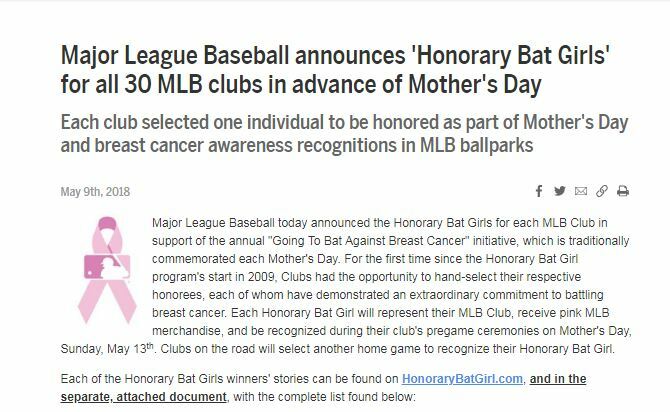 This press release from Major League Baseball was released at the beginning of May and tied into the upcoming celebration of Mother’s Day. Tying a press release to a holiday or celebration is effective because people more easily recall events associated with well-known holidays. 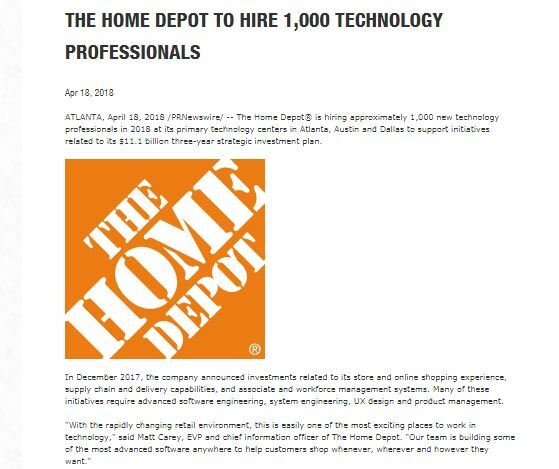 This press release explains how The Home Depot is expanding their technology department to improve online shopping. Shoppers, investors, and journalists were interested in this type of development from a public company because it showed business growth and investment in creating a higher quality customer experience. 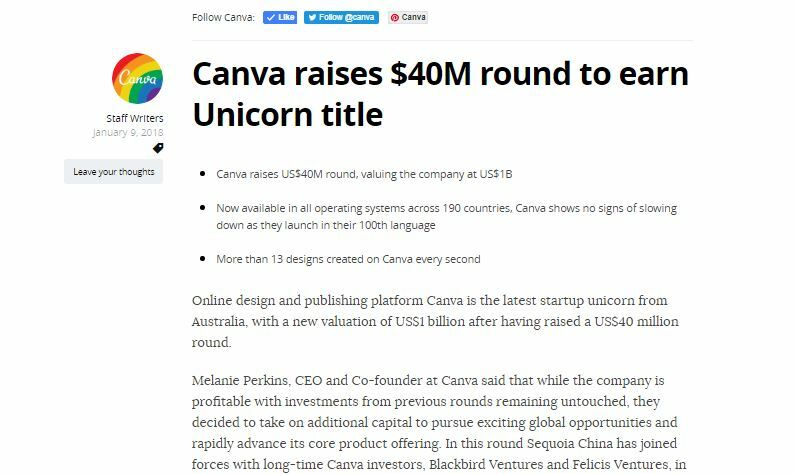 This press release showcases a major milestone for Canva—$40 million raised in new capital. People are interested in hearing about huge wins from a company they like, so it is effective in getting the attention of both journalists and the public. Peapod announced their new headquarters in Chicago with this press release, which included a quote from then-Mayor Rahm Emanuel. Emanuel’s quote created local buzz and lent credibility to the Peapod announcement. This press release announced the hiring of Dara Khosrowshahi as CEO of Uber—a buzz-worthy topic given the scandal surrounding former CEO Travis Kalanick. Most media outlets are interested in leadership changes within a bigger, well-known company, in large part because it is an indication of where the company is headed. A press release should generally be 400 to 600 words. If the topic of your press release deals with a complex issue, it’s worth stretching those limits a bit. In most press releases, however, brevity is the best approach. What Are Some Good Reasons to Send a Press Release? If an event is newsworthy in the context of your industry, consider sharing that news via a press release. It’s also worth considering the potential impact of a news story about company developments; if they are likely to spur company growth and customer interest, consider distributing a press release about them. Is a Press Release Good for SEO? Not directly. In the past, marketers would use a press release to create links to their website from other prominent sites (called backlinks) because this helped boost SEO. Today, however, press releases are predominantly used to generate news coverage. That said, releases can appear in Google search results if they contain frequently searched keywords. For this reason, it’s worth considering adding high-volume keywords to your headlines and subheaders. Should I Have a PR Firm Write My Press Release? It is not necessary to have a PR agency write your press release. Any competent writer can write a press release following the guidelines in this article. If you don’t have the time to do so yourself, you can assign the task to an intern, a marketer, or any team member who has writing ability. Also, consider hiring a PR expert from a site like Fiverr. Should I Pay to Get My Press Release Distributed? It depends. Syndication gives your press release a far wider audience, which can result in your news being picked up by a big news agency. If you are a small company, however, the cost of press release distribution might not be worth it; it might be more advantageous to share your press release via your website and social media. If you need more information on distribution options, read our article on the top press release distribution services. A press release is a statement that is distributed to the media to help generate media coverage and public awareness of specific company news. You can create your own using a compelling headline, subheader, event details, boilerplate, and contact information. If written correctly, it is a fantastic tool for businesses to get press coverage and build brand awareness. Writing a stellar press release and getting it into the right hands can be time-consuming, however. If you need help with both writing and distribution, try eReleases. They will help you compose a stellar release and send your news out to 5,900+ news networks and media outlets. Plus, you can save 33% on your first press release. Click here to get started.